Wood burning stoves Barnsley. Live in the Barnsley area and looking for a wood burning stove? We at the Leeds Stove Centre are one of the leading suppliers of wood burning stoves to the Barnsley area. At The Leeds Stove Centre we strive to provide you with the biggest selection of wood burning stoves possible to give your home that combination of warmth, aesthetics and style, all rolled into one. One feature at the heart of most modern stoves is efficiency. Due to tight emission laws and rising heating bills, stoves need to be compliant, to ensure money isn’t wasted in an attempt to heat the home. 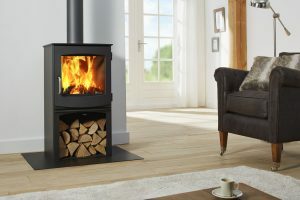 A large selection of our top quality wood burning stoves can be viewed in our 4 floor stove showroom in Leeds, just up the M1 motorway from Barnsley. If you visit our showroom you will be able to get a good idea of how your stove will look and feel and also feel the warmth that our wood burning stoves create. We pride ourselves on the quality of the wood burning stoves we provide. Therefore we only stock stoves from the leading manufactures such as Stovax, Charnwood, Hunter, Dik Guerts, Yeoman and more! Our comprehensive range of stoves and products and superb service ensures that we can provide you with an exceptional experience that will certainly meet all of your requirements and hopefully exceed them where possible. In addition, we are also able to install your wood burning stove in your home. We have a large number of highly experienced HETAS stove installers who can install your stove and any flue system to the highest of standards.